The BatAction Machine is often called the "Basketball Goal" for the Baseball and Softball Players because it is as easy and accessible as your backyard basketball goal. And we all know hitters love to swing as much as hoopsters love to shoot. When you have the BatAction Machine, the player walks up, takes 100 fun swings, and then walks away! The BactAction Machine makes batting practice just that easy! A SHORT 20 MINUTE WORKOUT, JUST 3 DAYS A WEEK, with the BATACTION MACHINE, is all a batter needs to greatly improve. However, players that own this machine, on the average, hit it at least 5 times a week! That's why some of THE GAME'S HOTTEST HITTERS are BATACTION MACHINE OWNERS. They are good because they love hitting the "Bataction Machine" and it's always in their backyard when they get the urge to hit! This Machine is a GREAT CONFIDENCE BUILDER! Increases of 100 to 200 points in a player's batting average is quite common once a player begins to regularly workout on this machine. Give your favorite player or team the "Bataction Advantage" over their competition. Order Now! Please Click the Link Below! If you are looking for the machine to give your team an advantage over the compeition, you can stop looking! You have found it! The BatAction Machine is 100% Guaranteed to improve skill and batspeed. We don't sell machines! We sell success. This machine is guaranteed to improve hitting skills. The engineering and technology that went into the design of this machine make it superior in quality, performance and productivity to other practice machines. This machine is "second to none" when it comes to boosting batting averages,increasing bat speed and power, eliminating strikeouts, and enhancing personal and team performances. Yes, it's revolutionizing home and team workouts. It is becoming a known fact that the hitter that works out regularly, on this machine, will have an advantage over a hitter that does not. This machine allows more versatility, repetition, and correct fundamental practice than any other machine ever invented. This machine produces hitting success! Satisfaction Guaranteed! I know that this machine will make your player or team hit for a higher average! This machine works! I am selling a machine that I love and believe in whole-heartedly. I have seen what it can do for an average player, for a great player and for a whole team. I want to let you and your "Future Prospect" experience the benefits of regular workouts on this machine. At Nedco, we take great pride in our products. We know that the products we design, manufacture, and distribute make better players. We don't just sell machines. We sell success. We provide future prospects with a machine that is guaranteed to help them achieve up to their maximum potential as a hitter. We are so confident in our Bataction Machine that we back it with a "Success or Money Back" Guarantee and a 2-year warranty that is "second-to-none" in the sporting goods industry today! I know that you take baseball or softball serious or you would not be here now doing your "homework"! I also know that you have made a commitment to do whatever you can to help your favorite player or team succeed. I know that you require and expect high performance levels when you purchase baseball equipment. You and I are just alike when it comes to demanding quality on and off the field. I strongly recommend that you make this purchase. You will never regret it! After just one workout, I am confident that you and your son or daughter will fall in love with this machine and look forward to experiencing regular high quality backyard workouts together!. And if your son or daugther wishes to practice alone while you are at work, this machine allows him or her to do so. Your son or daughter will have their own personal hitting workout station, right in the back-yard. That station is always ready to use. There is no hassle of setup or lengthy preparation time. They just grab a bat, takes a few warm-up swings, and in minutes they are taking full speed practice swings. It is can easy to take a dozen, two dozen, or two hundred swings. When you away or at work your player can work alone. There are no balls to pick up or chase. This machine simply provides convenient "ever-ready" and "hassle free" practice for your son, daughter and their teammates. You can expect your son or daughter to show great hitting improvement and higher performance levels. You will definitely not be disappointed. and everything to gain! You will see hitting improvement that makes you happy or you get your money back! This product will work for you if you just give it a chance! You have my word on it! Happy Hitting & Good Luck! This Machine is Backed By A 100% Money Back Guarantee! Attention Coaches and Parents!!! If you have been looking for the "edge" to give your favorite player or team an advantage over the competition, YOU CAN STOP LOOKING! YOU HAVE FOUND IT! For Hitting Success, Buy The Absolute Best! 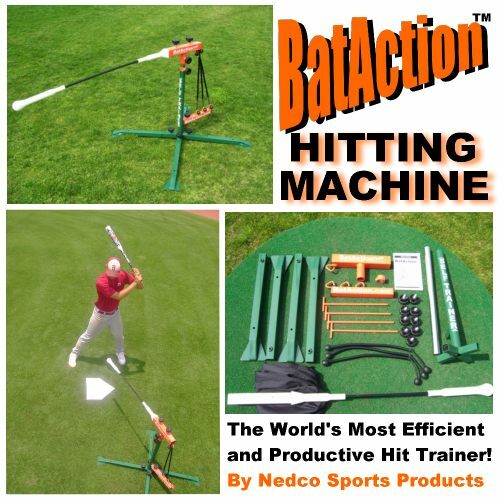 The BatAction Hitting Machine by Nedco is showing a rapid growth in popularity in the baseball and softball world. The innovative new design in hitting machine offers many features and benefits that are unmatched by other products. There are three things that are really impressive about this machine. 1)The first thing that you notice when you see the machine is the high speed ball movement. The machine has a moving ball that rotates in a 8 1/2 ft. circle. The height and speed of the ball's movement can be adjusted to match the age and skill level of the hitter. This moving ball makes practice a lot more challenging, productive and fun. It also accelerates skill and batspeed development. 2)The second thing that grabs your attention about the machine is that it gives the hitter instant high quality feedback. Just like with a real ball, the hitter can quickly see the quality and power of each swing. This instant feedback is vital for rapid skill development. This feedback is what makes this team or "practice alone" machine so effective in quality swing development. 3)The third thing you really notice is that players really love hitting the BatAction Machine. The machine offers a wide range of drills. Players especially love the "streak drill", which may be the best "machine drill" in all of baseball and softball today! The speed and movement of the ball make practicing more fun. Therefore players want to practice more often. That's where the machine has picked up it's nickname, "Backyard Basketball Goal For Hitters".